In his 1961 Inaugural Address, former President John F. Kennedy said, “Ask not what your country can do for you, but what you can do for your country.” This quote inspires Landon Woodyard, son of father Corey Woodyard and his wife Jennifer and mother Gina Johnson and husband James, every day. In high school, Landon was involved in Cross Country, Basketball, Track, FFA, the All School Play, Forensics, and Art Club. He is also involved in the Berean Church Youth Group. Landon attends St. Mark’s Episcopal Church and it is there that he completes his service project every month. Here he helps clean, work fundraisers and church events, and completes the church’s daily readings. “This project has shown me how important service is and how much it affects myself and others,” said Woodyard. A memory Landon will never forget is TVL Forensics his sophomore year, when he accidentally brought a package of underwear in his snack bag. 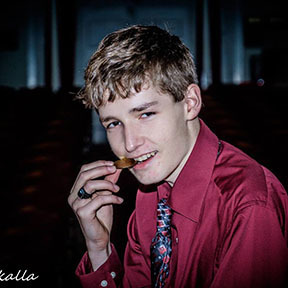 He is most proud of placing third in Solo Acting Humorous at State Forensics his sophomore year. Landon hopes to be remembered for being able to make everybody laugh. After high school, Landon plans to enter the Military as a pararescue in the Air Force. His father, Corey inspired Landon to enlist. It is now Landon’s future dream to be stationed in Colorado as a pararescue, while serving his country in every way he can.